In yesterday’s post, Mysterious timing for Chicago school closures, I talked about how the Teach for America Board of Directors sat down at a planning table and projected that they would be staffing 50 new charter schools in Chicago . . . several months before 50 public school closures were announced. The question is, did they help cause the closures? I say yes, absolutely. Privatization of public schools is in their mission statement. Their board of directors is responsible for planning and strategy. They benefit financially from the conversion of public schools to charter schools, because they staff charter schools far more often than they staff public schools. And they have the means to influence public policy, through financial and personal ties between TFA, charter school organizations, and public officials. These ties are well documented here, here, here, and here. However, “TFA is evil” is not the lesson we need to take away from all this. The lesson to take away is that 501c3 nonprofits make good frenemies. They can have a beautiful awe-inspiring mission statement. They can have lovely documentaries on PBS and Univision. And they can still be acting against you. It’s because of what 501c3 nonprofits are. They’re organizations that claim to have a social benefit, and maybe they do or maybe they don’t. They’re tax-exempt because of that supposed benefit. Donations made to them are tax-deductible, making them a playground for the ultra-rich with their charitable foundations. And they live or die by their funders. That means their funders have to like the work they do in some way, shape, or fashion. The board of directors is responsible for making sure that a nonprofit follows its mission statement, and even more importantly, pleases the funders. Maybe it pleases the funders and has a social benefit too. Yay. Except not exactly. Unlike the public sector, which is accountable to the public, the nonprofit sector has no accountability to the public or to the people it is “helping.” What’s lost here is the power of self-determination. So to know what a nonprofit is really doing, you need to look at the funders and the board of directors. This is easy to do. 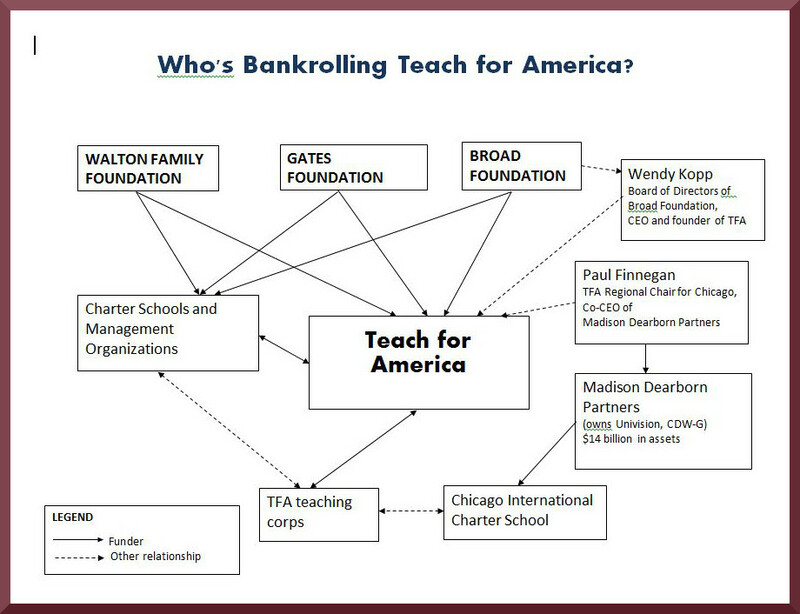 Google “Teach for America donors” and “Teach for America board of directors” and there you have it. You can learn some interesting things that way. Well, here’s what I learned, starting from the Lines of Influence diagram made by Dora Taylor and Sue Peters, and going from there. I’ll start with a diagram and then explain a few of the highlights. The first thing to notice is that TFA’s big funders include the Gates Foundation, the Broad Foundation, and the Walton Family Foundation (owners of WalMart). Those three philanthropies hold enormous amounts of money — tax-free. They get the tax exemption because of their supposed social benefit. And they get to advance their aims, which in this case involves the privatization of public schools and teachers. The second thing to notice is that these three funders donate both to Teach for America and to charter schools. In practical terms, that means that they have the power to use any of the organizations to advance the aims of any of the other organizations. And they do. The third thing to notice is that charter schools and TFA have a symbiotic relationship. Charter schools provide opportunities for the TFA teaching corps, whereas TFA provides low-cost, inexperienced teachers to charter schools. So they have a natural tendency to help each other out. The fourth thing to notice, Paul Finnegan, was just a sideline for me. It’s the kind of thing you find out when you go peeking into boards of directors and seeing what their members do. I have to be careful not to do too much of this, but since I looked at him, I might as well explain the connections. I have to pause here and say I have not found a smoking gun or anything earthshattering or anything like this. This is just the normal way a nonprofit does business. The members of its board of directors often come from leadership positions in the private sector, because managing a nonprofit is a whole lot like managing a for-profit. And the members of its board of directors often come from funders, because after all, what happens if you say no to a funder who wants to sit on your board of directors? Okay, so Paul Finnegan. He is the regional chair for Chicago. So of course, he makes strategic decisions for Chicago. I imagine he must have sat in on that board of directors meeting in January where they discussed the plan for 50 new charter schools. I have to admit, a lot of this is gobbeldygook to me. But you know what isn’t? Holy cow! This guy is the co-CEO of a company with 14 billions of dollars worth of assets. That means he controls 14 billions of dollars worth of assets, as well as all the subdivisions and acquired companies and so forth. I’m sort of starting to understand why a person like that wouldn’t care about the closure of the 50 public schools or the impact it will have on the communities, children, and displaced teachers. He just plain lives in a different world, that’s all. I just wish he would stay there and quit messing with things he doesn’t understand. Univision, a Spanish American TV company. Free PR for whatever nonprofit he wants to support! Yay! CDW. Who-what? Wikipedia to the rescue again. “CDW Corporation, headquartered in Vernon Hills, Illinois, is a provider of technology products and services for business, government and education.” That’s profiting off another kind of privatization, outsourcing, but really beyond the scope of this post. And they donate to something interesting as well: Chicago International Charter School (CICS). Haven’t I seen that somewhere before? Oh yeah, I have. It was in this spreadsheet of charter schools that are expected to open. Six new schools, serving 3500 students, and providing a whole lot of jobs to TFA. To recap: a 501c3 nonprofit, whatever its social benefit, is ultimately accountable only to its funders and its board of directors. And to understand what a nonprofit is up to, you don’t have to look any farther than that. Friend or frenemy? Check them out. 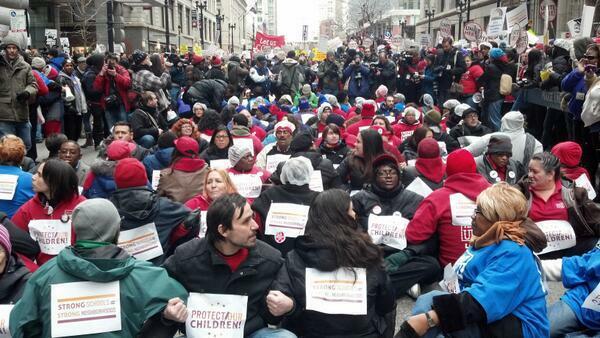 This spring, thousands of Chicagoans gathered to protest school closures. 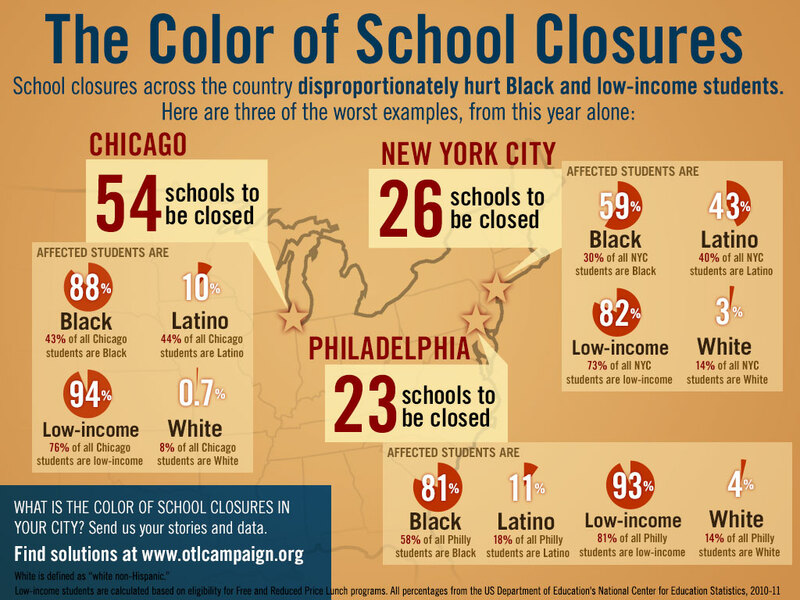 54 schools were closed, against the wishes of the impacted communities. If you’ve missed this story, you can follow it back all the way to 2011 on the Huffington Post. The official story behind the closures was that they were underutilized and that Chicago Public Schools just didn’t have the money to run them. But at the very same time, the school district is requesting applications from charter school companies. They’re closing neighborhood public schools, against the wishes of the communities impacted, and replacing them with privatized charter schools. But I digress. I was talking about the mysterious timing. What I’m talking about here is Teach for America, the nonprofit that was originally supposed to staff schools where teachers were hard to find. I remember learning about it many years ago from a PBS special. It showed a bright-eyed, passionate teacher going into a difficult classroom and excelling. Great, right? Not so much, as it turns out. In January, months before the school closures were announced, the Teach For America Board of Directors by some strange coincidence projected that the number of charter schools in Chicago would double, or in other words, increase by 52. The same number as the public schools that closed. Was Teach for America involved in the school closures? It sure looks that way. Blogger Ed Shyster, who broke the news about TFA’s charter school projections, argues that these projections represent “backwards planning” in which those in power decide on the result they want (52 new charter schools) and then design the plan. He further points out that there are close ties between TFA, charter school companies, and charter school authorizers (who help decide which charter schools can open). The Washington Post Answer Sheet reprinted his blog post in the article “How Big Can TFA Get?” Check it out. Why would TFA do this? If the mission is to help poor communities, why would TFA override their express wishes to keep their neighborhood schools? I think the easiest way to answer this is to look at an article from the right-wing blog Education Next. TFA leaders go on to become “educational entrepreneurs” — which is to say people who are starting charter school organizations or otherwise privatizing education. Just to be clear, “opening schools” means opening charter schools. And “social entrepreneurship initiatives” means privatization. And why would TFA want to privatize education? This part is really really important. It isn’t because TFA is somehow “evil” or whatever. It’s because the people who run it, who have loads and loads of money and power, think that privatizing our schools is the best way to “help” our communities. But look back at the original photograph here. These people didn’t want to be “helped” by having their schools closed. Next up: Are nonprofits our frenemies?